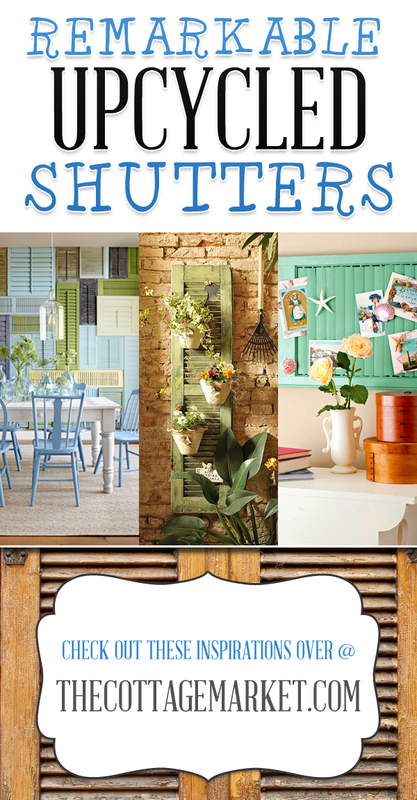 Shutters…Shutters…Everywhere!!! 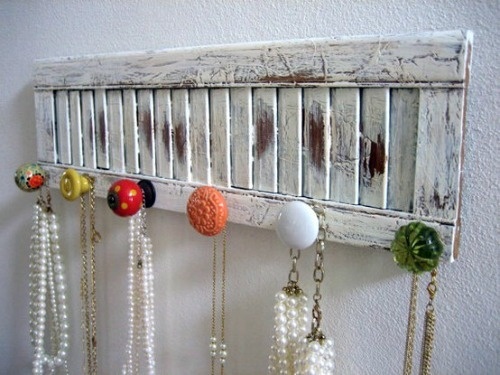 Let’s take a peek at somecreative uses for this slatted piece of wood…who knew how much potential they have! 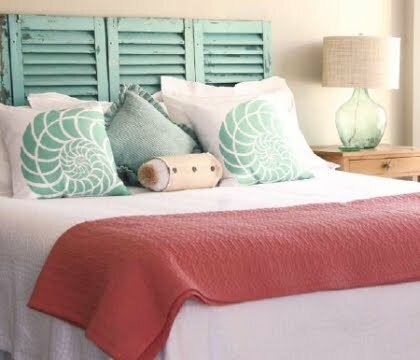 sure shines a light on a fabulous way to repurpose a shutter…I love it and you can do it with a cool shutter and your favorite paint…make it with your own style and you will be ready to hang it in an hour…LOVE IT! Kari combines a wall of whites and the end result is NOT short of amazing! What a great mood these beauties set on this patio! 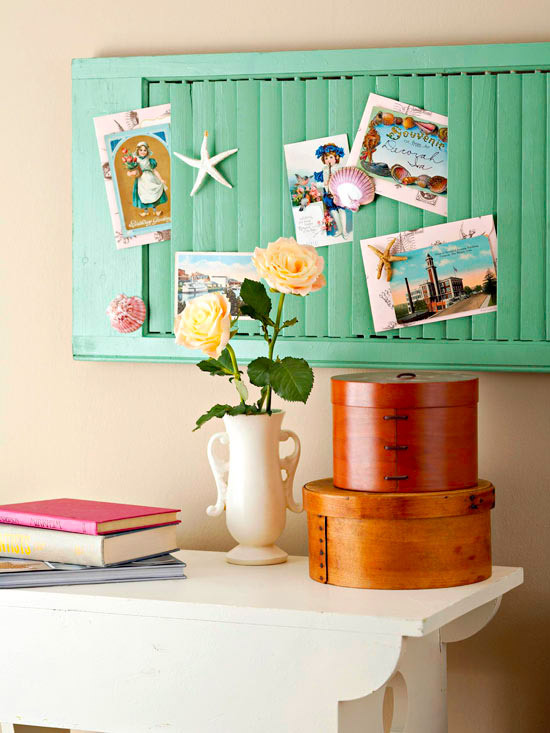 Here’s another fabulous use for a shutter…paint it in your favorite color or give it a crackle or some shabbiness…the skies the limit and then you have a place for all those special little postcards…notes and more! I snatched this pin up but was unable to find the original link up…but I think you can get enough inspiration from just a picture…give a shutter a paint or stain treatment of your choice…add some cool knobs and there you have it! Now here is some drama on the patio! 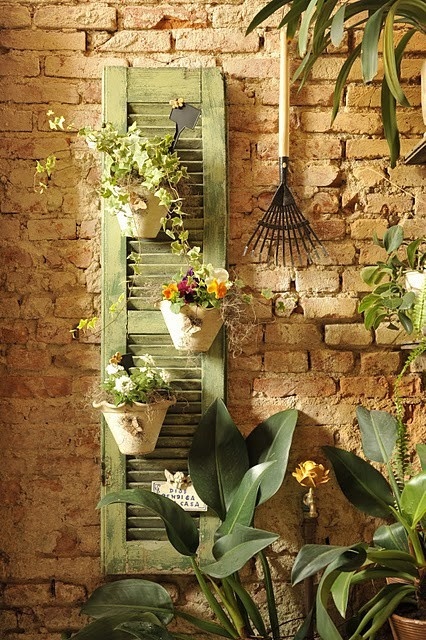 How cool is this… there are succulents growing in the slats…tons of potential with this idea! 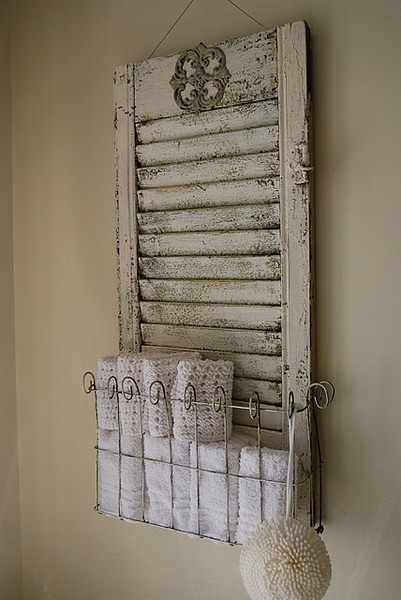 If you are looking for a charming cottage touch any where in your home…one of these will do the trick! then there is this dramatic wall that is surely the focal of the room! 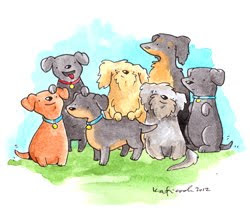 Take a peek over here to see more! 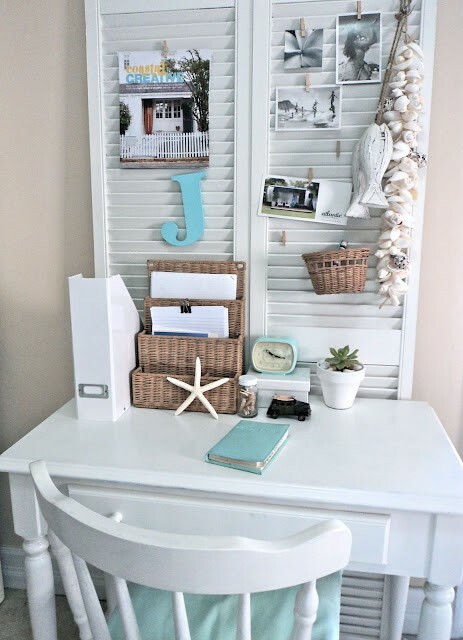 2 simple shutters create a great organizer and may I add…tons of styles to this work area! creates this fabulous little table…so simple and so much style! 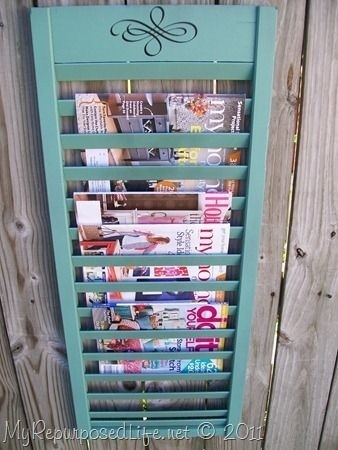 If you are handy with a saw…you can create these and maybe even use it as a magazine rack? Now here is another simple project that you can create in just a few hours…again…color…treatment…accents…makes it your own! Oh what a great shelf! 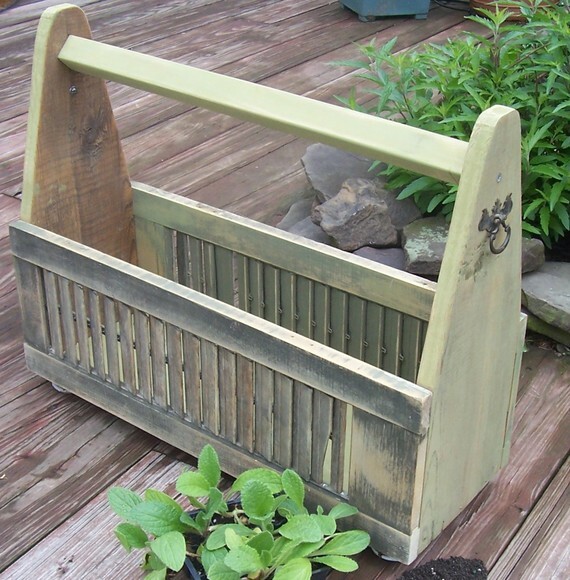 This fabulous idea can be used inside or out…just think of the possibilities…it’s gorgeous! 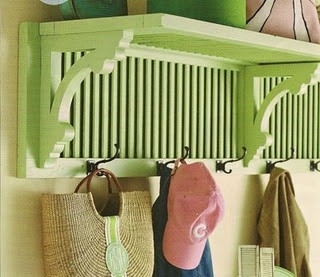 Now this shutter door is the full organizer including a bulletin board…really a great idea! 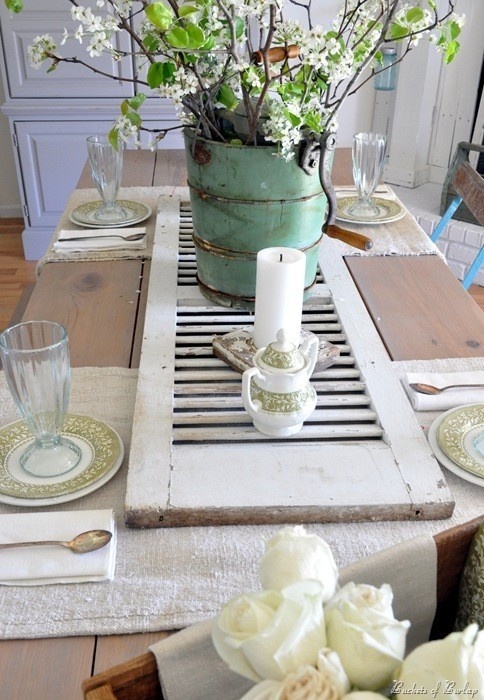 Leave it to HGTV to use a shutter for what I personally think is such a natural…a great table! Another natural for the shutter…how great is this! 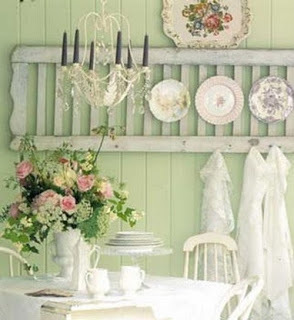 Now if you want to add a bit of charm and drama to your table…how about this…what a cool idea and oh the possibilities! 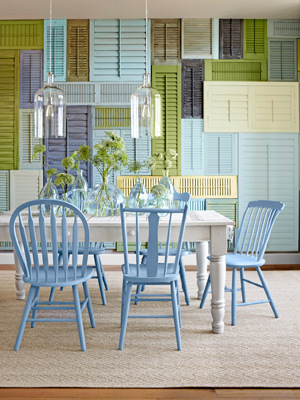 Now this pin shows us the potential that the simple shutter has in a little hanging array…this looks fabulous! 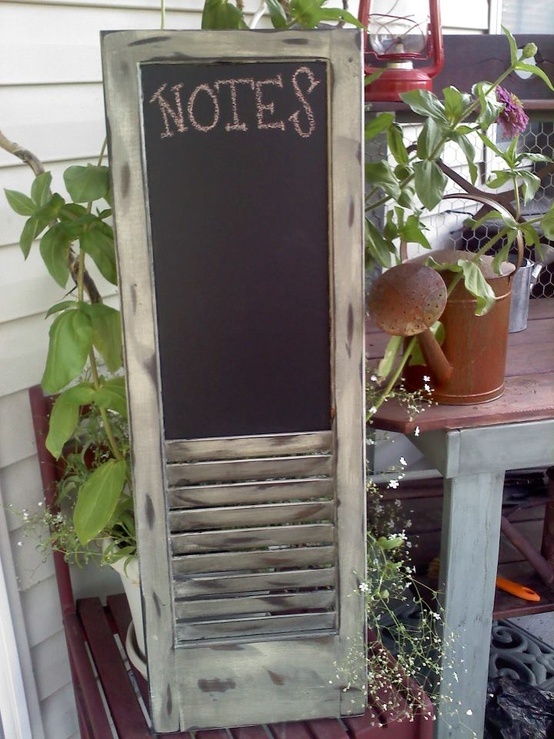 A Chalkboard Shutter…Love it! 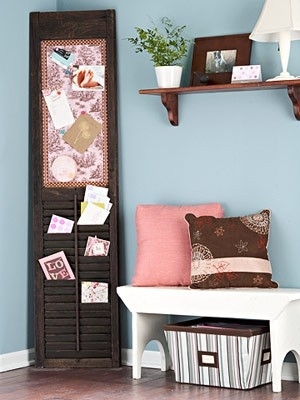 Write notes…and it holds mail…cool idea and as always…just take the idea and make it your own! and click onto the video…fast forward to almost the end and you are going to see the most amazing ceiling created with aqua shutters…it is soooooooo cool! Well this topic will have a part 2 in the future because there are just so many other things you can create and I want to show you them all! So now when you see a lonely shutter sitting on the side of the road waiting to be discarded…save it…save all of its friends and give them NEW life in so many different ways!!!! See you tonight for the graphic of the day! 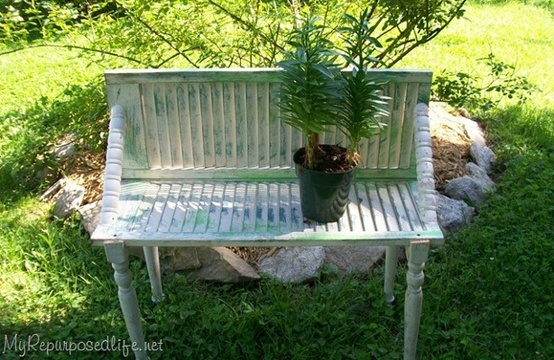 oh just one more since the last picture was small…LOVE THIS Plant Bench!!!! 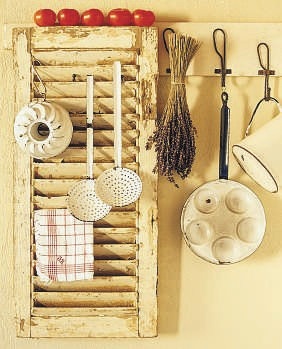 Wow, all of them are such clever and useful ideas – I love the pot and magazine holders, and the shelf, oh, and the plate holders – hard to decide! Great post! Each one is just so beautiful…I kept reading and saying, “I love that! No, I love THAT…”. 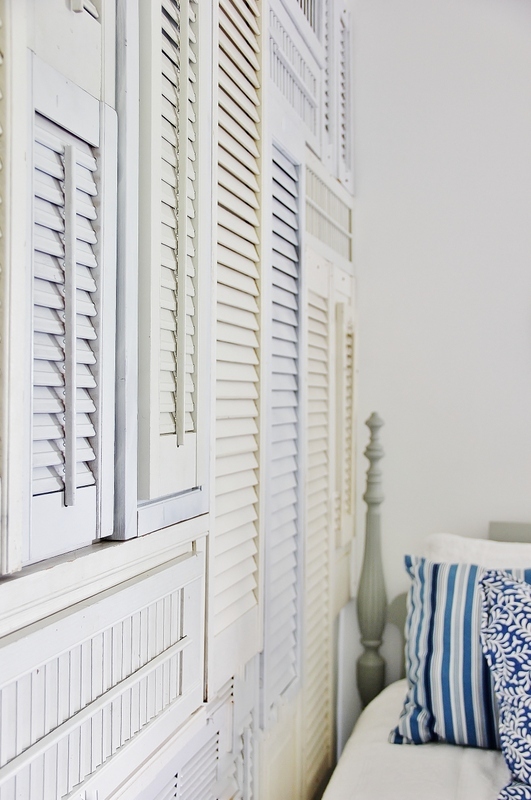 I think my favorites are the perfectly chippy aqua shutters as a headboard. Thank you for sharing! These are all great. I think my favorite one is the little chippy green table on the brick porch. So cute! 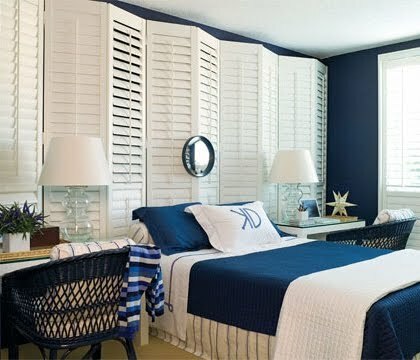 Thank you for your ideas on custom shutters. 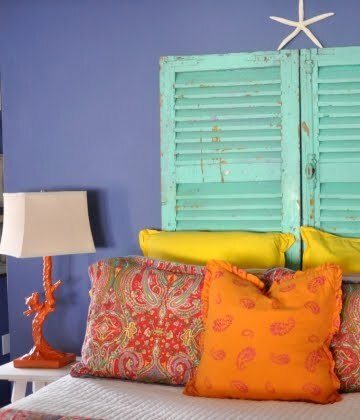 It would be nice to decorate you home shutters for it to look so pleasing. I just love your collections. They are the best! 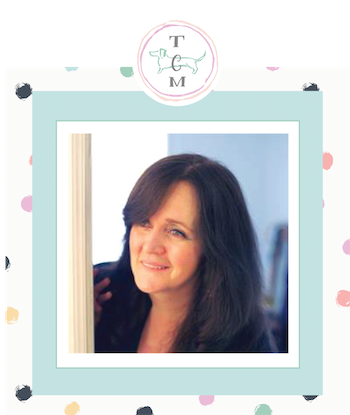 Just wanted to give you the heads up that the wall you credited to Country Living (as they did a feature on it) is actually the work of oliveandlove.com. It’s so gorgeous and I just want her to get proper credit! Love this round-up! Thanks Kate and Andrea! 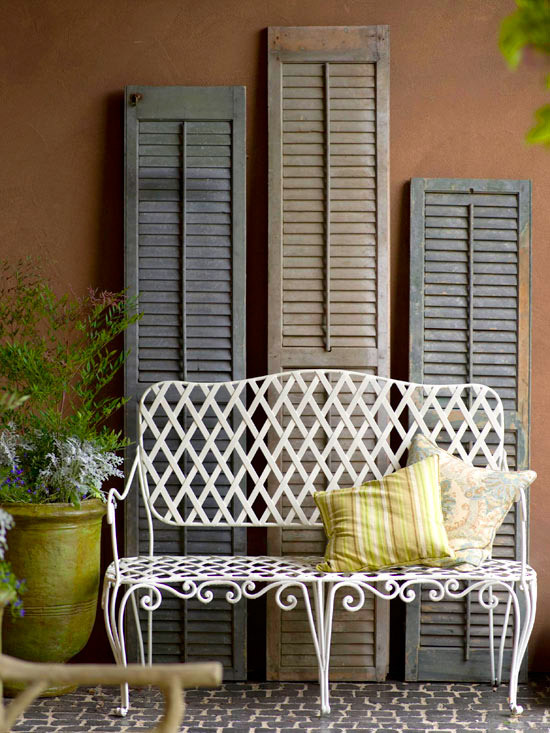 Great collection of shutters! Thanks for the link up. I did something with shutter closet doors,,,,,made room dividers and a “room” for my daughter. I hang stuff on the side away from her room,,,she hangs stuff on her side of room. and she has her privacy. 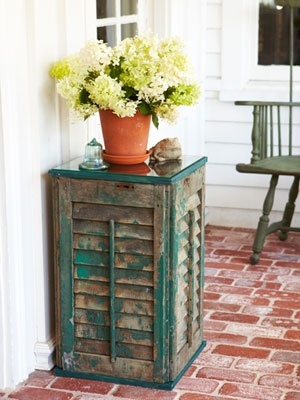 Oh how I love shutters! 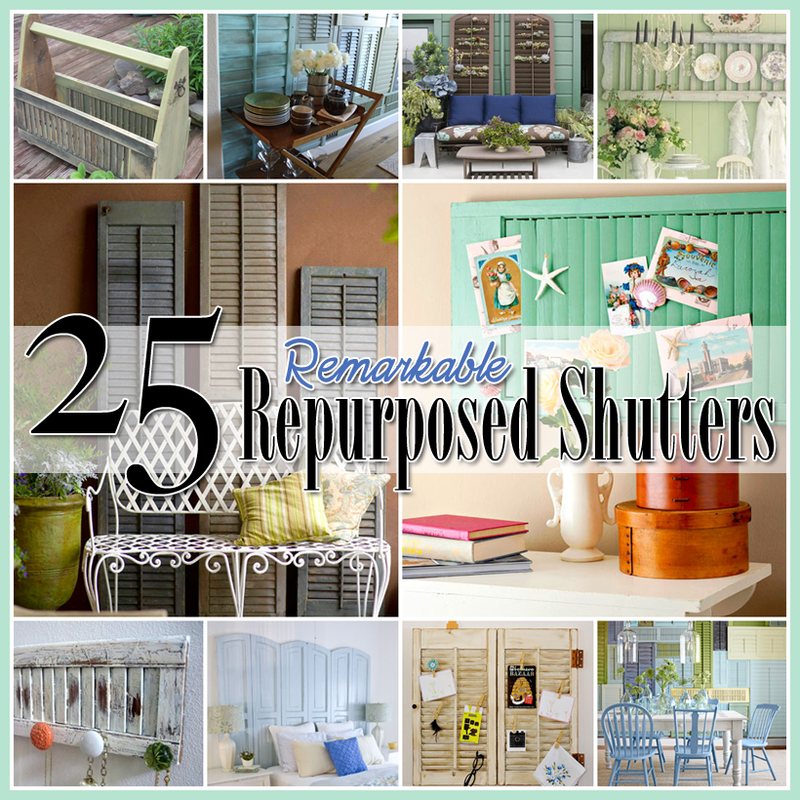 I actually did a shutter series of sorts on just different kinds of shutters I have used in my own house!! My living room lights get tons of comments!! 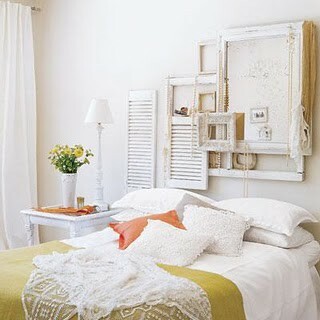 Thanks for just more ideas recycle all things shutters!! I love them all! I had a nice long double shutter that I painted green & crackled. Kicking myself 50 ways from Sunday cos I donated it one day. Just got tired of it. Wish I had it back!